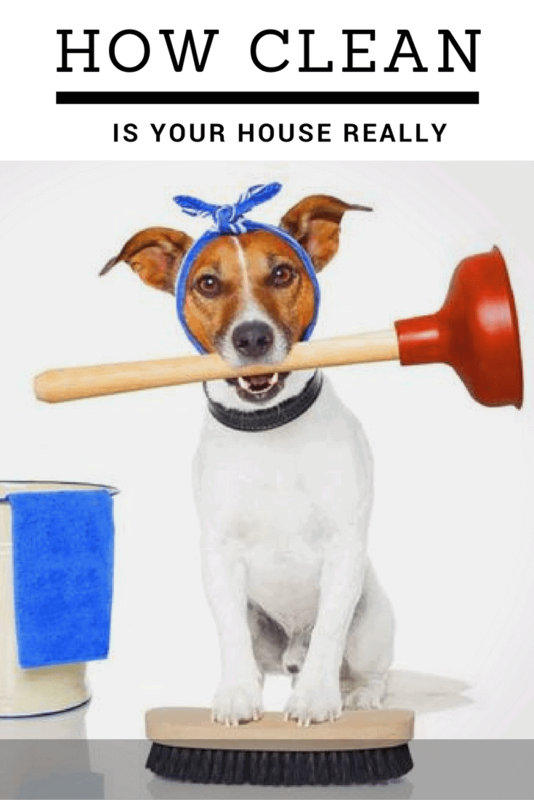 How Clean Is Your House Really? Our tips to keep it clean with dogs! How Clean Is Your House Really? Read our tips to help you keep it clean with dogs! Home / Uncategorized / How Clean Is Your House Really? Read our tips to help you keep it clean with dogs! The answer: probably not as clean as you think! If there aren’t any obvious dust bunnies or fur balls chasing around your floors, it’s easy to comfort yourself by thinking your house is completely clean. Unless you’re walking around barefoot, you won’t even notice the fine coat of dust on all your hard flooring. And most of us don’t look closely enough at things like baseboards or wood molding to see just how much dust and debris is caked on them. 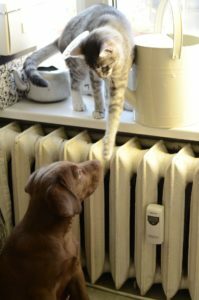 When it comes to managing pet allergies, though, you have to take cleanliness to a whole new level! The truth is, the majority of us live in homes that are far from clean. We take care of the big, obvious stuff, but there’s still enough dust, dead skin, and so on floating around to sustain colonies of dust mites, spiders, and all manner of tiny creatures like carpet beetles and silverfish. Your task is to sharpen your vision and pay more attention to the fine detail around your home. Next time you’ve cleaned according to your typical routine, get a while disposable glove, and go around testing surfaces like cabinetry, hardwood floors, baseboards, and so on. You’re almost guaranteed to come away with a grey or black finger. These persistent, tiny particles that are left behind after a normal cleaning are what cause allergy symptoms. If you’re missing them or leaving them behind, you’re going to keep on sneezing or wheezing no matter how often you clean. Besides, even if you’re a pretty thorough housecleaner, there are probably a number of things that you haven’t thought to address. This how-to guide is packed with our tips and recommendations for keeping a house as clean as you need to live with allergies! We’ll point out areas you may not have thought to clean, and help you come up with a cleaning routine to follow every week. The average household vacuum is no good for cleaning up after pets–not if you have allergies! Most vacuums on the market let allergens slip right through their filters, so that cleaning simply sprays them around even more. Use something with full HEPA filtration and a sealed air system, so that you can capture microscopic particles and quash your symptoms. You can find links to all our buying guides and allergy-ready recommendations on our homepage. You should also make sure you’re using a vacuum that allows you to reach anywhere you need to, from floor to ceiling! If you’re missing spots, you’re missing allergens. That’s why most people should be using either a canister or convertible cordless model. You need to be able to reach anywhere dust and dander can settle, not to mention pet hair! Vacuum regularly, too. You want to get to it at least twice a week, to prevent any unhealthy accumulations of allergens. Use one cleaning as a maintenance run, usually during the middle of the week. Get to all the floors and corners, but don’t worry about higher places or the details. On your big weekend clean, be more thorough and tend to all the nooks, crannies, and surfaces above the floor. Make sure you vacuum absolutely everything you can. Use all your attachments, and get used to spending a bit more time to do a thorough job. Pay attention to baseboards, especially if you have baseboard radiators. They tend to clog with dust and hair like crazy. Use your dusting brush for shelves, cabinetry, wood molding, and windowsills. Always use a bagged vacuum if you have allergies yourself. They’re by far the best at containing allergens. If you don’t have allergies, and are cleaning a home where someone does, you could get away with using a bagless model if you prefer. Make sure to empty it in the garage or outside the house. Be careful not to get any allergens on the outside of the vacuum or your clothes, too! It’s easier to use a bagged model, if we’re being perfectly honest.We do recommend a few bagless models, though, because some do a very decent job containing things, and they’re so popular. While your vacuum is your primary weapon against allergens, you should also be taking advantage of your washer and dryer. They’re perfect for eliminating and neutralizing allergens that stick to clothes, bedding, and other fabrics. Don’t neglect your frequently-worn pieces of clothing, either. Many people don’t wash their sweaters, jackets, and hoodies very often at all. Make sure to wash yours at least weekly, along with any other layering pieces that you tend to wear frequently without running through the laundry. Use a steam mop if you have sealed floors, since they’re so simple and effective. Old-fashioned mops or dry-mopping cloths are the best on unsealed floors. Make sure you’re using a microfiber cloth which will trap allergens!The point of this is to take care of pet allergens stuck to surfaces, especially saliva. Wipe down countertops, windowsills, and any areas where airborne allergens could be accumulating. No matter how frequently you groom and bathe your animals, they’re always going to produce some amount of allergenic proteins. Get in the habit of washing your hands after a snuggle sesh on the couch, and after grooming. That’ll cut the risk of you touching your face with allergens on your hands or spreading them further. Shower before bed, too. That’s a good idea if you spend lots of time with your pets at the end of the day. When most people clean, they pay lots of attention to places where dust has accumulated, but not to the places where it’s spread around. Circulation points like vents, fans, and so on usually accumulate huge amounts of allergens. When you use them, they blow all around the house. To address airborne allergens, use a HEPA-grade air purifier and keep its filters clean. You can usually vacuum them, so make that part of your weekly routine! Clean your HVAC or a/c filters regularly, too. You don’t need to do it in off seasons, but vacuuming them before you turn the climate control on and each week during usage seasons is common sense. Wipe ceiling fan blades, too! An astounding amount of dust ends up on them, and it’s a major eye irritant in waiting.